As you disembark from the ferry, The Island Gateway welcomes you with the Bainbridge Island Museum of Art, Kids Discovery Museum, Fletcher Bay Winery, Bainbridge Brewing, Agate Restaurant and the BIMA Bistro and Gift Shop. With beautiful indigenous gardens, and nationally recognized sustainable building design made to compliment the surrounding environment, the project invites you to come shop, eat, and play. The Island Gateway boasts ample office and studio space for clients such as Solius and McLennan Design. The Eagle Harbor Market EVENT CENTER is available for private parties or as a piece of larger, complex-wide event. Whether you live on the Kitsap Peninsula or are just visiting, no trip to Bainbridge Island is complete without a stop at The Island Gateway for a bit of fun and relaxation. Coates Design Architects is established on Matthew Coates’ vision of Responsible Architecture. This philosophy entails creating designs that will impact the environment positively as well as the people who inhabit them. 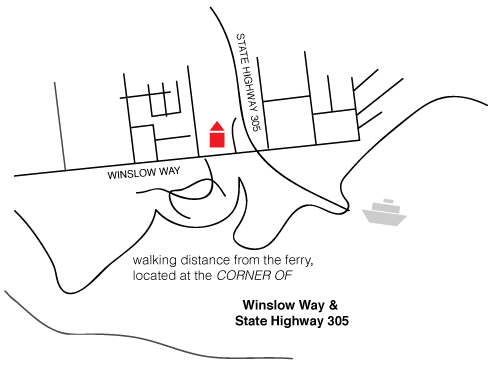 An example of this is using practicality and process oriented regenerative design to create buildings that will help the ecosystem by creating its own food and power. The architects at Coates Design are committed to make designs that integrate nature with the needs of society making each one of their structures more than just a building, they also become educational. The Island Gateway gardens were designed to be a natural respite from the hustle and bustle of daily business, and add to the attraction of The Island Gateway. 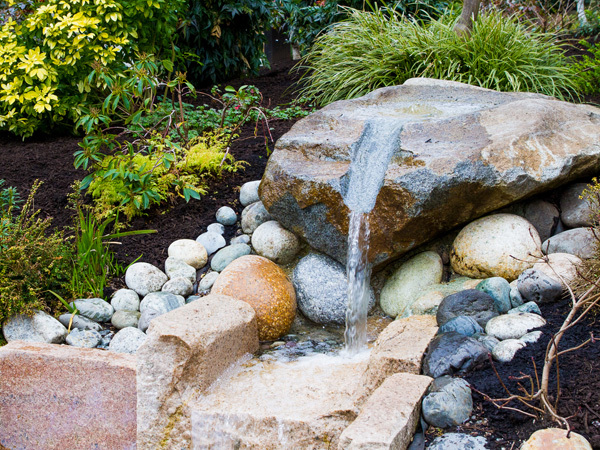 The water feature invites you to sit and enjoy the motion of the water while the wind tickles the trees and plants to release tantalizing smells and enchanting motion of the art of nature itself. The gardens are a wonderful place to enjoy the plants and walkway, the water and stepping stones, the flowers and the grasses while remaining grounded in the present. Following the philosophy of Responsible Architecture, the buildings in Island Gateway have been constructed to diminish negative impacts on the environment and use Regenerative Design to make each of the buildings serve a purpose beyond their obvious intended use. 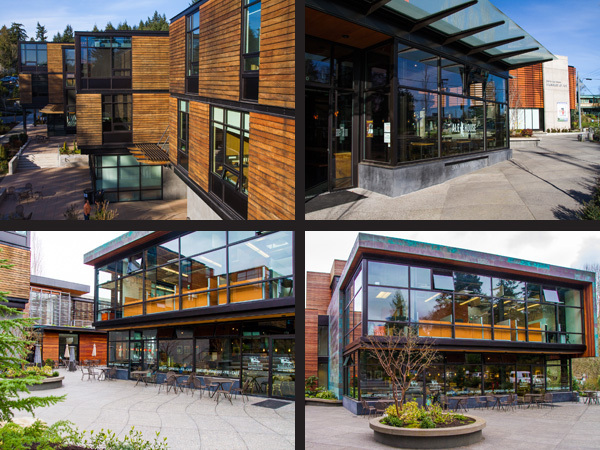 The Bainbridge Island Museum of Art, for example, not only is aesthetically a modern beauty, but also serves as a small clean energy power plant. 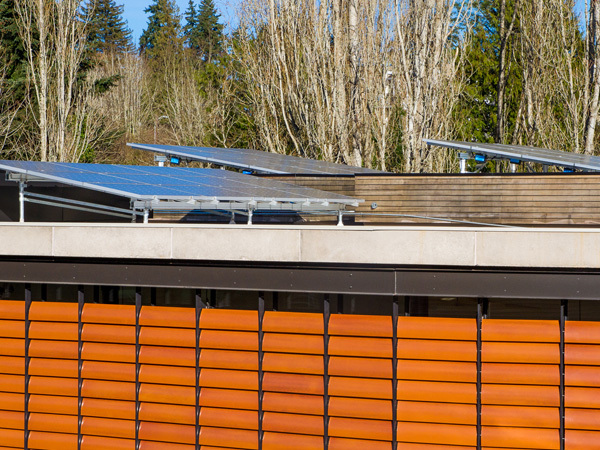 BIMA uses geothermal heat pumps and solar panels to create electricity for the building. KiDiMu also follows suit by having a rooftop garden to minimize runoff. By demonstrating proper sustainable architecture, Island Gateway has become a certified LEED Gold (Leadership in Energy and Environmental Design) building.